Rainy days. Everything looks more saturated – the greenery becomes greener, flowers stand out as rare pops of color, the tree branches contrast dark against the bright colors. 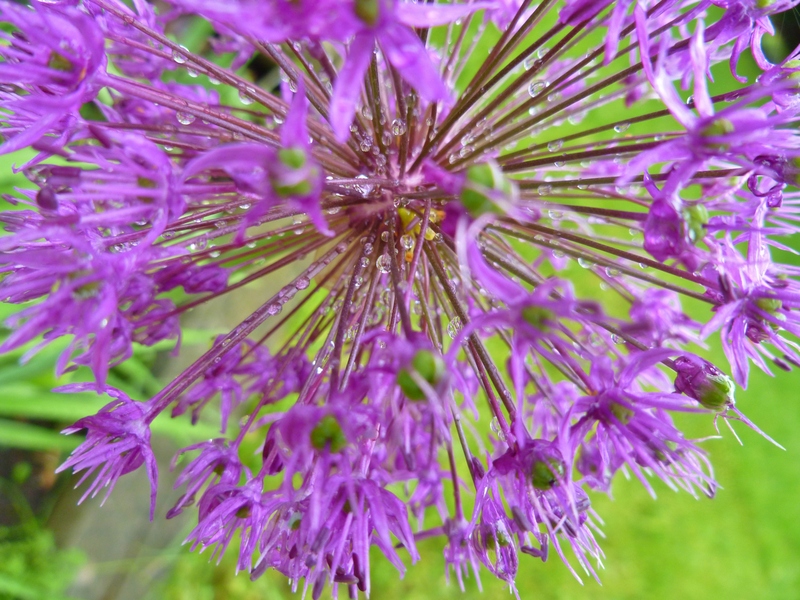 Raindrops are featured on petals and leaves – shimmering like little starlit orbs. The sun shining through the grey clouds eliminates strong shadows, and assures no detail will be lost. I couldn’t help myself – I had to get out the camera and take these pictures of my garden today. Thunder and rain only add to the majesty of the plants. Rain is perfect for a mug of coffee and indoor projects. My Upcycled choice of the day? This beauty was a $5 find at a garage sale this weekend. Works like a charm, and just needed a bit of cleaning. They even included all sorts of extra needles, bobbins, pins, and other helpful supplies. I’m thinking it might be from the 1970’s, but I’m not sure. It’s very heavy – a quality machine made out of all metal. I’m not sure if I can really express my excitement in finding this. I can’t wait to start creating all sorts of upcycled works with old fabric finds.